In my school years, I usually responded to this question by reminding my teachers that my name wasn't Sonny, then enviously explained that while all the other kids in class road-tripped four states away, I didn't do a whole lot. With school behind me, I don't get asked questions like this anymore, so it's up to me to reflect on my own what happened over my holiday weekend and this time I can say I had a great weekend and did lots! My Memorial day weekend started on Thursday when I began braising chicken for our chicken and apple salad with tarragon. It seemed like a good idea to get the food started early, but it ended up making everyone salivate all day, guests and staff alike. 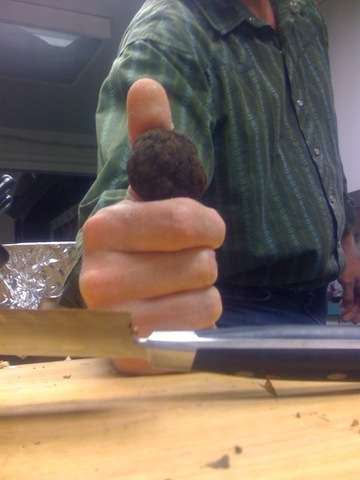 I also ran out to Yamhill to pick up twenty pounds of crimini mushrooms and some black truffles. I've use Misty Mountain Mushrooms and love their product and usually have them deliver but decided to get a head start and visit them myself. It turns out, that even though they have a Yamhill address, their warehouse is another twenty minutes west in the coast range. I raced through winding country roads, getting some good practice shifting back and forth between thrid and fourth gear. 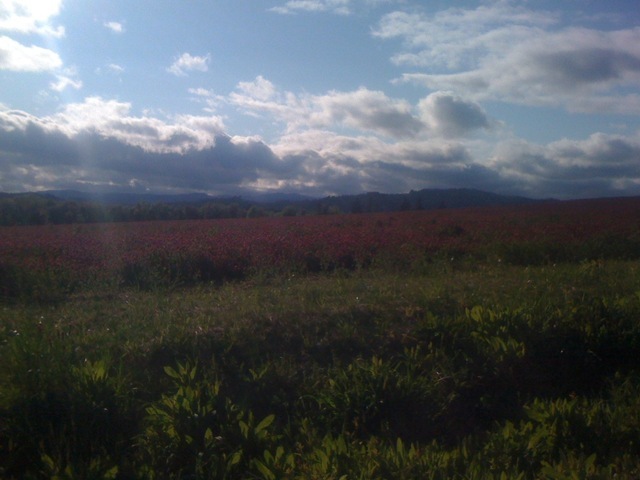 The scenery along 47 is incredible, but just five miles on either side and it feels like you're in another world. Chickens, chipmunks, pheasants, and quail scurried and fluttered off the road as i raced around corners on my quest for great mushrooms. With the mushrooms and the biggest black truffles my hands have ever held all in my clutch i had secured the ingredients for our food pairings. 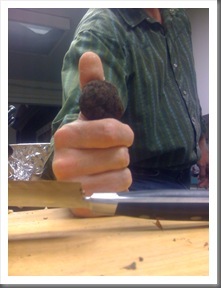 Now to rebuild the tasting room... but first, another whiff of those beautiful black truffles. I spent Friday prepping the mushrooms, and chicken salad, and getting everything else ready to assemble Saturday morning. I have discovered a habit, perhaps good, perhaps bad, but undeniable nonetheless. I find from years of living overseas, I practice what I am going to say in my head several times before i say it. If i am speaking to someone from another country, i use this technique to communicate more clearly, oftentimes converting my mental voice to their accent. When i am in the kitchen, i begin thinking with my limited culinary terminology from years of watching iron chef and reading Anthony Bourdain. I found myself referring to all of this prep as my "Meez". Bourdain has warped my mind! 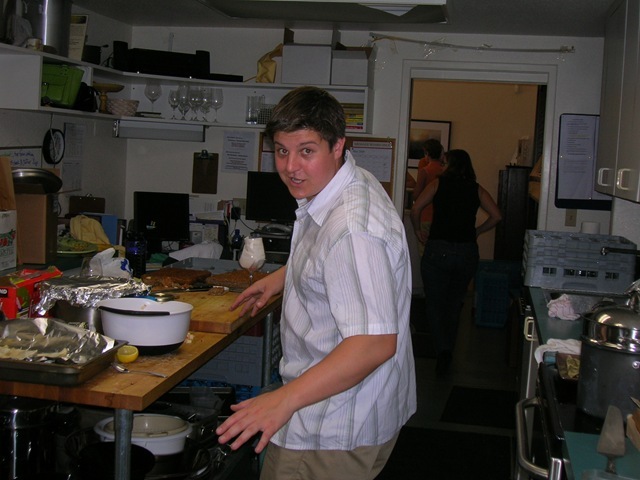 Tim, who helped me with all of the prep, reacted to my distorted kitchen dialogue with a tilted head blank stare. The kind of look I get from my dogs when I ask them if they want to watch TV. 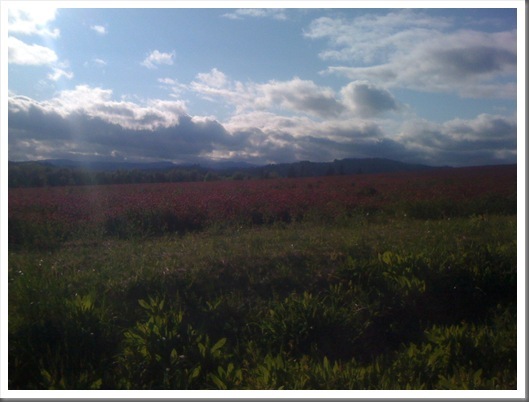 Saturday we flung open the French doors and welcomed beautiful weather (pictured above is a field of crimson clover seen from the patio). 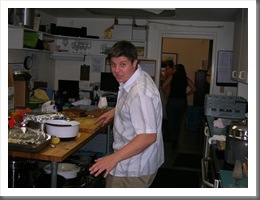 For a few members of our Tasting Room staff, this was not just a first event, but thier first day working at the winery. They were great!!! I wasn't worried, and in fact, hadn't even considered that they might not handle this sort of event well, until a guest made a comment to me while i rang him up at the register. It was around 3:30PM, which is about the busiest time of day, and we had easily seventy guests working their way through the tastings. It works out that each employee is pouring wine, and sharing information with about twenty or thrirty people all at once. He commented that, "everyone was very nice and knowledgeable", which he appreciated because, "sometimes when it gets busy like this, people can be rude." As soon as he said that, it occurred to me that we've found some really great people to work with. The day wrapped up without incident and the feeling that we had shared some great wines with our guests, and that they all enjoyed themselves while they were here. The biggest hit of the day was our 2007 Cuvée A Midnight Saignée Rosé of Pinot Noir which flew out of the fridge and onto tables on the patio. Sunday's dreary weather didn't deter people from enjoying the Memorial Day Weekend in Wine Country one bit. We made it through the day without a hitch, just as the day before, and other than feeling like none of us need to look at another mushroom flatbread, or chicken and apple tea sandwich for a long time, we closed the doors just after 5PM, slouched into comfortable, mission-accomplished relaxation, and washed it down with some bubbly. Even though I didn’t travel out of state, I’m sure that my weekend was more exciting than sitting on Grandma’s couch. Pre-Memorial Release Party: Feeling HOT, HOT, HOT! We pre-released the new 2007 whites for vineyard club members today just when mother nature released the 95 degree heat on us. The timing couldn't have been better. Thanks to our great vineyard club members who came out to join us today (and suffered with us through air conditioning issues!). I also wanted to mention that since our Hospitality Director, Ksandek Podbielski has come on board he has created and prepared foods for each and every club event. Last night, I chopped veggies until I felt carpal tunnel syndrome coming on but he kept going until 10:30pm. 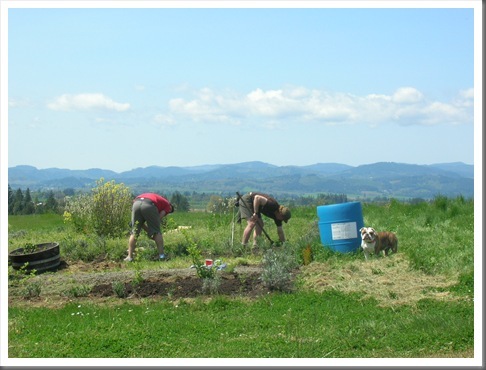 It's that kind of dedication that makes me proud to be a part of Anne Amie Vineyards. 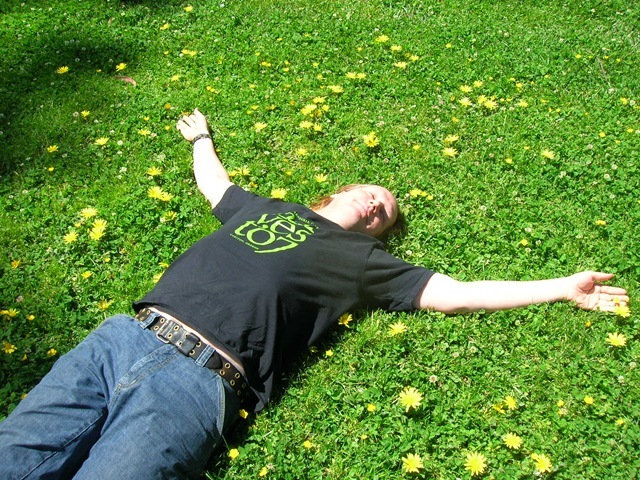 Ksandek will most likely hate me for this but I have included his photo for those of you who have yet to meet him. He's a master in the kitchen, he knows our wines inside and out, has a genuine passion for wine and food from every place imaginable (hey, he's polish) and has created a camaraderie within our staff that is priceless. We hope you'll join us in our tasting room this year. We have some exciting new wines that we're dying to show off. We're now open daily from 10-5 and for those of you that love our wines and decide to join our vineyard club...Ksandek has implemented late hours on Fridays and Saturdays starting June 1st for club members only. The view is spectacular and chances are he'll have whipped up something special for you in the kitchen. 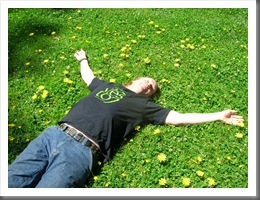 Ahhh...to have that young energy again. Thanks to Gabi, Julie and Danielle (who rocked on her 1st day!) for working so hard and making our workday fun. Yesterday Thomas and I spent the day doing work withs in San Francisco and Berkeley respectively. 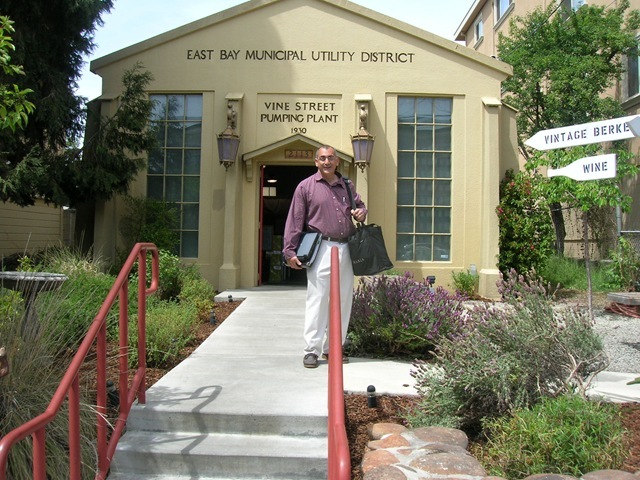 Pictured above is Rick Mickaels from the Henry Wine Group in front of one of the coolest wine shops I've been in - Vintage Berkeley. 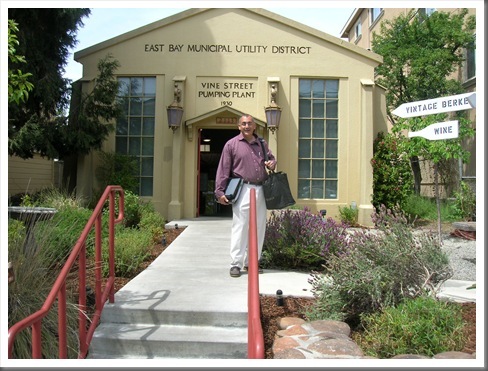 The shop is located on Vine Street (of course) in the old 1930's municipal water pumping station. The focus is on small production wines and if all goes well they'll be picking up our 2007 muller thurgau! After a long day we enjoyed dinner at Absinthe in San Francisco where we shared an assortment of oysters and a bottle of our good friends and neighbor Soter's Brut Rose. It was pure heaven and a great reward for the last three busy days. Thanks, we'll see you soon California! 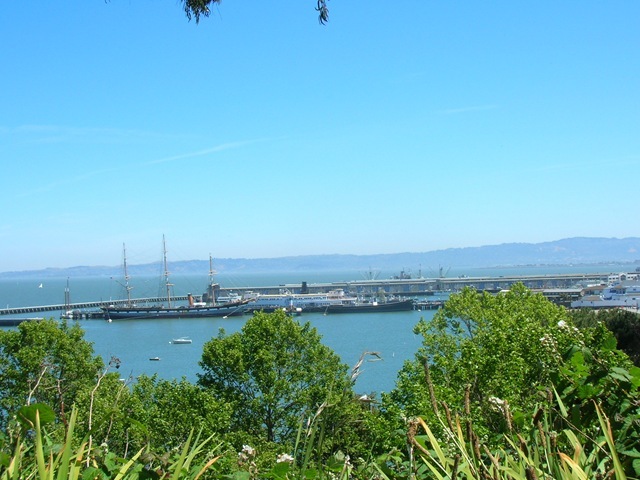 Today was the final "Discover Oregon Wine" Road Show at the Officer's Club at Fort Mason in San Francisco. 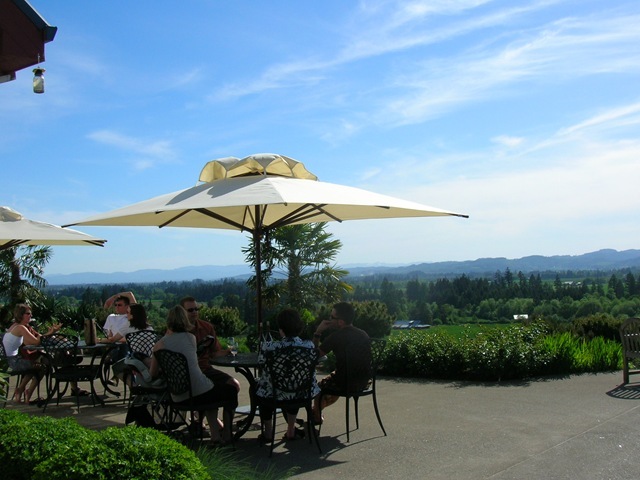 Wines from 40 wineries all over Oregon were showcased in this unique trade tasting event. Chef Vitaly Paley from Paley's Place in Portland even made the trek down to pair his amazing culinary creations with our wines. It's interesting how so many people don't realize that Oregon even has a wine country and "you can grow cabernet and syrah in Oregon? But it's COLD and RAINY!" Well, we were all there to answer questions like that and more. 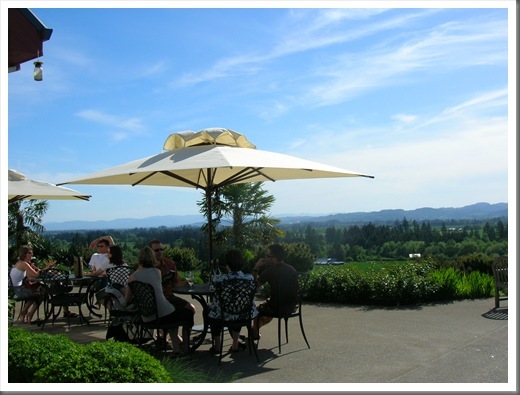 Oregon has 16 AVAs and with almost 400 wineries and about 800 vineyards we have a lot to offer any discerning palate. 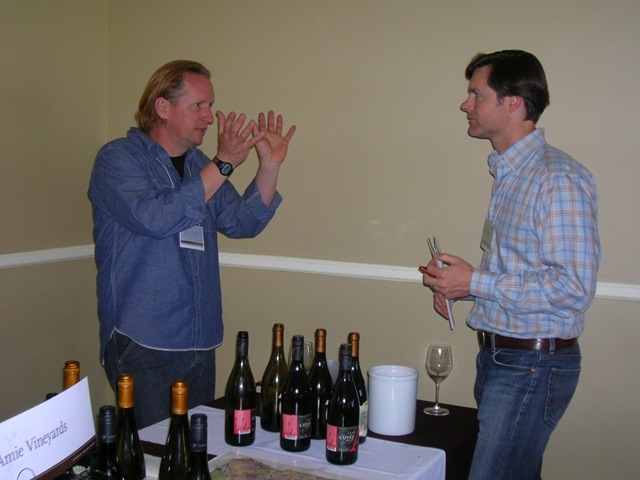 Today Thomas and I had fun showing off his 2007 releases - Estate Riesling and the new dry Muller Thurgau. I love hearing "I'll skip the muller thurgau" and then after the first sip it's all they can talk about. We also previewed our 2006 Winemaker's Selection Pinot Noir which won't be released until around Thanksgiving. Both the '07 Riesling and '07 Muller Thurgau are available now and can be purchased from our distributors, the winery or our website. We had a great turnout so hopefully you Californians who know a thing or two about Oregon wines will find more and more of us popping up on lists at your favorite restaurants and retail shops. Thanks to the Oregon Wine Board for putting this all together and thanks to everyone in DC, Dallas, NYC and San Francisco who took time to come out and see us. What a relief! 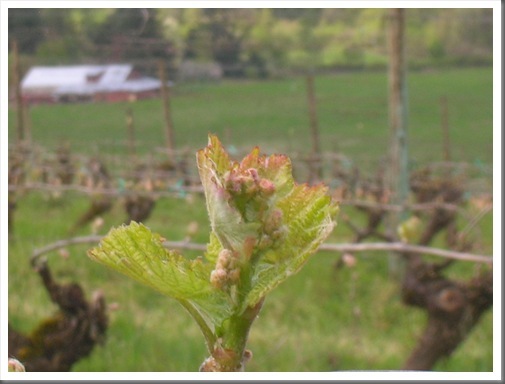 So many of us vineyard managers were joking whether we would get bud break at all this year...that joke got old when we entered May and still no bud break. This year I am calling it the Cinco de Mayo bud break event, one of the latest we have recorded in the Willamette Valley. 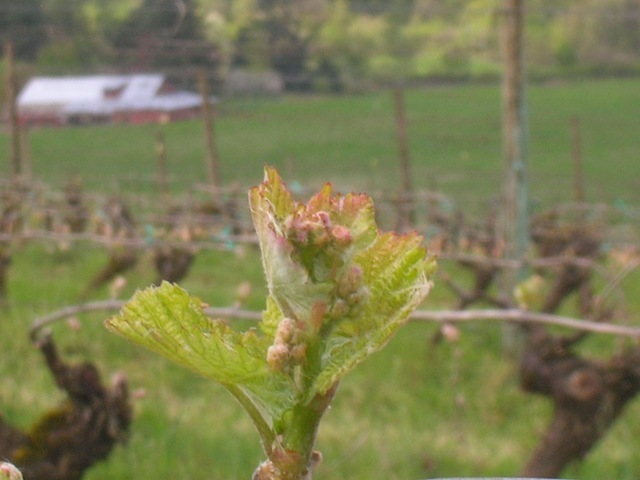 Bud break normally occurs around April 15th. This week marks the true beginning of the growing season for growers. The time of year when the vineyard manager brushes the moss off his back, puts on his running boots, fires up the equipment and begins the dirty dance of growing fine wine. There is so much to look for when the buds start to push. What I like to see is very clear in the picture above: little pink flower buds waiting for their chance to be the most noble of all white wines, Riesling. Let the sun keep on shinin'! We've been taking advantage of the nice weather this week planting in our garden and in our back yard. 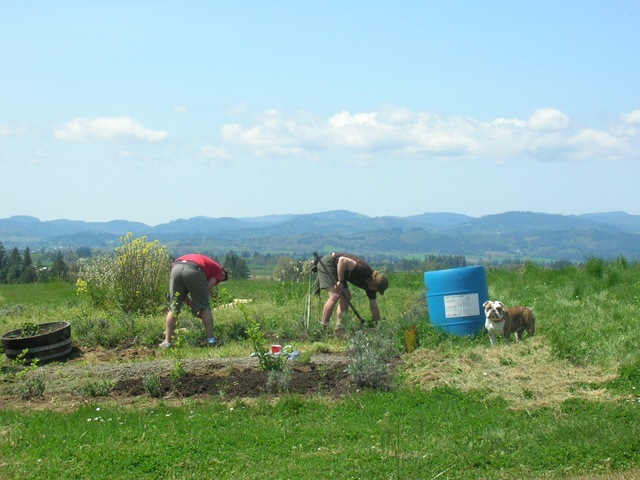 Pictured above, Thomas plants fava beans while Ksandek prepares the land for his culinary herb garden. 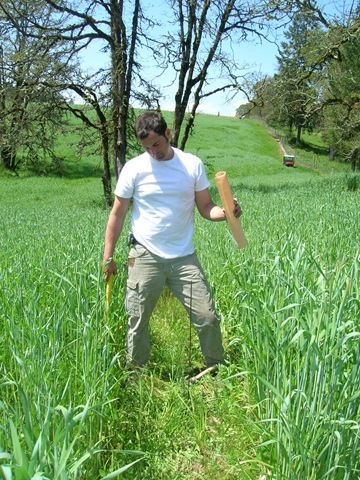 Below Jason makes me happy by helping me plant some doug fir starts that I got for our tasting in San Francisco. 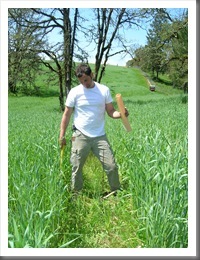 Yamhill-Carlton District Open House April 26. His head sort-of bobbed down and towards me at the same time, elongating his neck like a pleasantly surprised turtle. "What's going on here today?" spilled from his now wide open grin, with equal parts excitement and curiosity. He didn't wait for a response, "we thought we would take just advantage of the weather, you know, buy some wine and sit out on your patio. But this...this is great!" 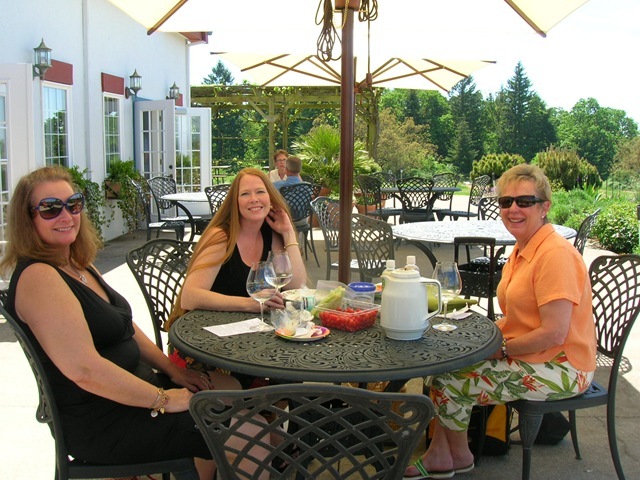 I didn't need to explain that we were hosting an open house for wineries of the Yamhill-Carlton District AVA. 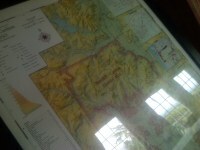 He and his friends had already figured out what the 14 stations set up throughout the tasting room were for. "So do we get a glass here, or how does this work?" A ten dollar donation later, he and his friends each had a glass and a program to accompany their rightful excitement to taste some of the wines from the Yamhill-Carlton District AVA. 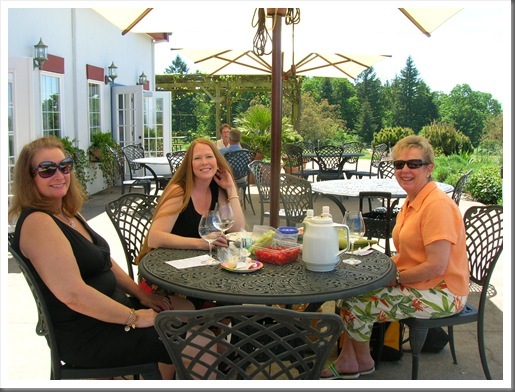 Then, they slipped out of my sight, into the tasting room, and I greeted another group of guests who was equally excited to start tasting. It seemed like this was a pretty standard response for the course of the afternoon. Regardless of having known in advance, or just happening upon the tasting, all of our guests were excited about the chance to taste some serious wine. I have to admit, I felt the same. 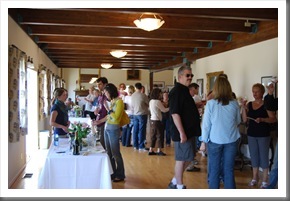 In the four hours that the open house ran, we shared our wines with over 200 guests. Many, many thanks to; Atticus, Barbara Thomas, Belle Pente, Carlton Cellars, Carlton Hill, Elk Cove, Kramer, Racine, Resonance, Roots, Stag Hollow, and Twelve. It was absolutely a pleasure to host you all in our winery, and I am confident in saying that we all represented the AVA well. 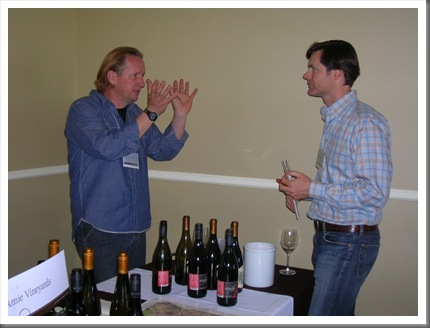 Our trip to San Francisco didn't stop with the intimate Oregon tasting. On Friday night we hit the 18th annual Wine Literary Awards at the California Culinary Institute in San Francisco. 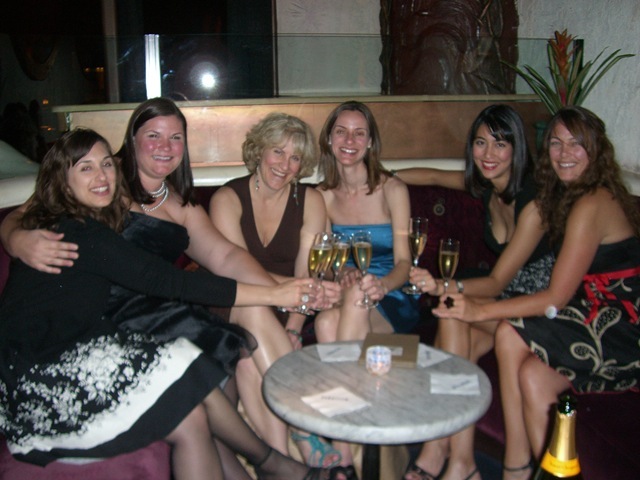 Armed with my lady posse in our fancy party dresses we headed to the "ball". Ben Narasin who attended our tasting the day before was the lucky gentleman to share a table with the six of us. 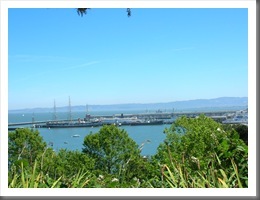 Ben is a freelance writer for publications such as the San Francisco Chronicle and Wine Enthusiast. 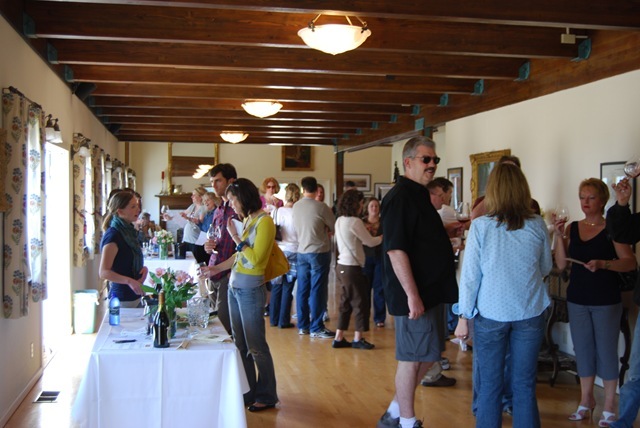 Over 1000 wines including several from each of our wineries (Adelsheim, Elk Cove, Willamette Valley and Anne Amie Vineyards) were opened for a grand tasting at 6pm. A dinner prepared by the students at the Culinary Institute was served and we all enjoyed a good laugh when Charles L. Sullivan, wine historian and author of the Companion to California Wine and recipient of this year's literary award was interrupted mid-speech by an extremely intoxicated party crasher. Mr. Sullivan handled it with grace and only paused a moment before finishing his joke. Pictured from left are Leah from Adelsheim Vineyards, Meg from Willamette Valley Vineyards, Shirley from Elk Cove Vineyards, Stephany & Mariko from the Oregon Wine Board and me. I might be biased but I think we clean up pretty well! I know I've said before that work travel is tiring but being included in this group of talented smart women and the wineries and wine board that supports us make it all worth it. Thanks for the memories ladies and stay tuned wine media...we might be coming to a town near you soon!